In my email, I am attaching your document for you to consider changes where I have used text boxes to include the diagrams sitting alongside the photographs, as similar to your presentation on your Blog. I believe this holds the document and images together in a more cohesive fashion. A much better way of presenting this (the document is appended below) as the thumbnails I used perhaps weren’t as visual as they could have been. Something to bear in mind in in future submissions of the blog in a word format. 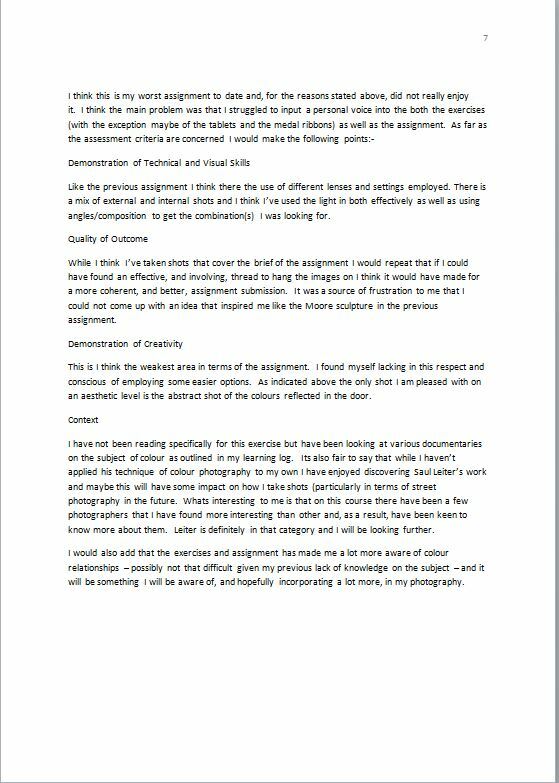 ‘I understand your aim is to go for the Photography Degree and that you plan to submit your work for assessment at the end of this course. From the work you have shown in this assignment, providing you commit yourself to the course, I believe you have the potential to succeed at assessment’. 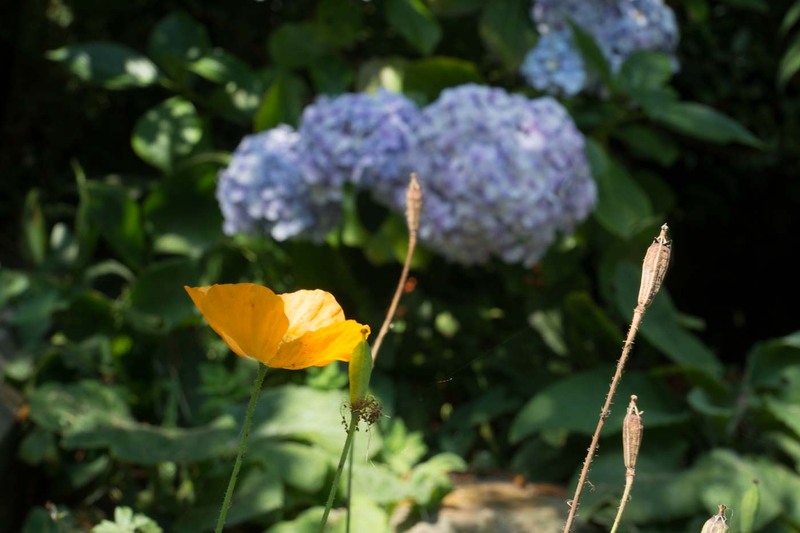 The first image of yellow and violet of the Violet/blue hydrangea and Californian yellow poppy are complementary colours, although you do have similar colours with blue and green and yellow and green. I have cropped the image to emphasise the violet/blue and yellow as below. The image of the blue and orange scissors stands out as complementary colours sitting opposite one another on the colour wheel. These are very striking colours in your composition and I agree there are interesting shapes in this photograph that hold the viewer’s attention. I also liked the unnaturalness (if that makes sense) of the strong colours of the plastics. The bottle tops make an interesting composition with these striking red and green colours and provide a good complementary image. This is a good observational shot. The following photograph of the text and background also conform to the theme. Red text showing the word ‘fear’ confirms the danger sign associated with the colour red. The strong yellow poppy heads and expanse of green cover this category of the theme and provide a soothing illustration of the younger poppy heads turning into seedpods to the right. The overall blurring of the background give the illustration depth in a three dimensional format. The following photograph does contain the elements of similar colours but I think I would have used this particular shot in the accented category as the bright blue ball stands out dramatically against the accentuated green background. I debated whether to use this as an accented shot and probably should have done so (or maybe gone closer in so the blue was not so much of a spot. The album cover suits the theme where the colours almost blend into one another even though they are definitely different colours. I thought the triumvirate of yellow green and orange went well in, as it where, steps of similar colours i.e. green/yellow and yellow/orange. With hindsight I probably should have shot the area behind the orange lower to get a good mix of yellow and green. Orange and green are contrasting colours, but the green and yellow flowers in the background of DSC03107 are similar. The violet orchid is in contrast to the green grass but is a complementary colour to the yellow background as it directly faces one another on the colour wheel. The orchid certainly does stand out in 3D in this shot taken in the churchyard. The Edge shot fits nicely into this bracket as both colours of red and yellow are primary colours. The next image of blue and yellow also consist of primary colours. It is unfortunate that the image is not equally sharp. It is fine to show one object sharp and the opposing one diffused but the blue in this case needed just a little more sharpness. Fair point again in hindsight I should have shot this using a tripod and with a greater depth of field. The dark purple colour of the fuchsia flower head is very striking and it contrasts heavily with other parts of the flower head. It is one of those colours that reside in between blue and violet and difficult to categorise. 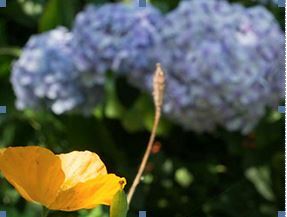 The yellow flower amid the green background is a good example of an accent of colour. I like the way you have composed the shot leaving a leading edge from left to right. In the following image of the strip of yellow colour, which is an accent amid the violet background is also complementary as you have stated. The reflection shot of folded clothes doesn’t come over, as I believe you see it. The original image may be more vivid than the one I am viewing. I have take the liberty of trying to enhance the image by increasing the vibrancy and contrast but in so doing this has caused what is known as Newton Rings on the door reflection, It does, however, bring out some further detail. This is a shame as this was my favourite image out of all the ones used in the assignment and followed on from reading about Saul Leiter.  I shall keep trying on this type of abstract image. The last image of the red spoon stands out dramatically as an accent of colour and being red in colour it is accentuated. Not all assignments can please, but this one does help you to look for certain patterns in colour and how they fit together or not so. It is an observational exercise that gets you thinking about the relationships regarding colour. Art and garden designers follow these patterns in their quest for the most desirable designs. It is interesting to note that colours have a distinct affinity with human reactions. Red is associated with boldness, danger and love. Blue has a calming effect. I notice you have some research on this in your Blog entries. Many large companies focus on certain colours to market their brands. Have a look at the website on Colour Psychology for more information highlighted below. I think (and hope) that maybe I picked up more from this part of the course than I realised. I would say why colour is not necessarily a primary driver in the images I enjoy taking I am hopeful that I will be more aware of it in future. Keeping sketchbooks and a learning log/blog is an integral part of this and every other OCA course, not only because they constitute 20% of your marks if you choose to have your work formally assessed but they are also an excellent way to see how you are developing. You have done some extensive research and recording in your learning log and thank you for sending me the PDF files. I imagine you will be sending the actual learning logbook for assessment, as not all the PDF files are viewable in the upright mode. Unfortunately Adobe Reader doesn’t seem to save the rotation if applied. The format of my learning log (an A4 exercise book) makes it difficult to scan the pages the same way up and any rotation done later does not alter the file. Its something I will have to think about in future. I’ve had a look at this and have made it the subject of a separate entry. Have a look at these examples of students’ work for the next assignment. Again I have had a look at these and they are discussed in my introduction to part 4. So overall not too unhappy with the report and hopefully the next assignment will be better! This entry was posted in Coursework, Part 3 - Colour, Part 3 Assignment - Colour on August 22, 2015 by Richard Brown.